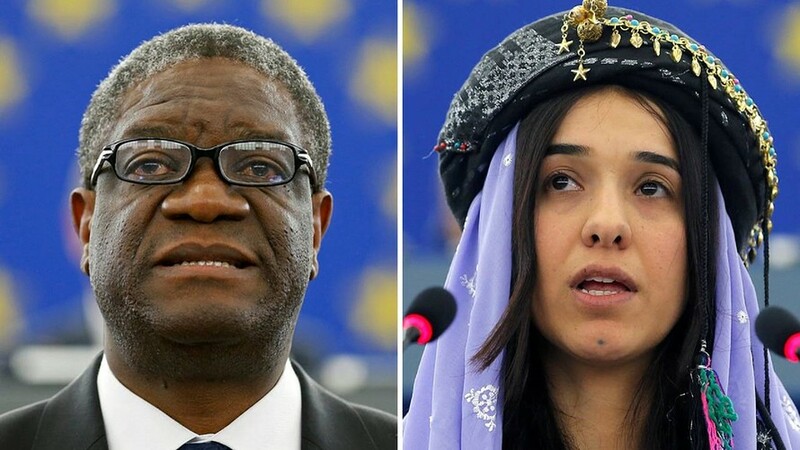 The Oslo Committee awarded the Nobel Peace Prize to Denis Mukwege and Nadia Murad. Murad is a young Yazidi woman who endured multiple rapes by Jihadis. She was held in the IS-installed “Caliphate” and was sexual slave. Dr. Mukwege is a gynecologist and works in the Democratic Republic of Congo where he treats women. He especially has helped women who have been raped, tortured and mutilated in war. The Committee cited the recognition of "their efforts to end the use of sexual violence as a weapon of war and armed conflict". Nadia Murad, 25, was taken in August 2014 from her native village of Kocho, near Sinjar, to Mosul, IS’s stronghold in Iraq.The young woman lost six brothers and her mother. She was subjected to repeated rapes and torture, along with thousands of other young women. During her captivity, she was beaten, burnt with cigarette butts, and raped several times. She escaped when her torturers were distracted, and in September 2016 she became the first UNODC* Goodwill Ambassador for the Dignity of Survivors of Human Trafficking. As soon as she was free, Nadia Murad Basee (with Lamiya Aji Bashar) had told the world about the horror that they, as well as thousands of other women and girls, had to endure under the ISIS yoke.